The LDI-G19 Series of LVIT (Linear Variable Inductive Transducer) spring-loaded position sensors from Omega are contactless devices designed for dimension measurements in QA labs, or position measuring applications in factory automation systems and in various industrial and commercial applications such as automotive testing, mil/aero test stands, robotic arms, and packaging equipment, where the sensing element cannot be attached to the object being measured. LDI-G19s are offered in nominal full scale ranges from 6.35 to 100 mm (0.25 to 4.0") with excellent resolution and high stroke-to-body-length ratios. The maximum tip contact force on the item being measured is 1 pound. 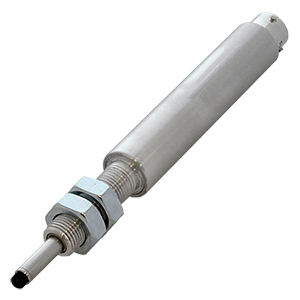 LDI-G19 sensors have a 19 mm (0.75") diameter aluminum or stainless steel body with a 1/2-20 UNF-2A thread 38 mm (1.5") along with two 19 mm (0.75") hex jam nuts for drop-in installation in place of a spring-loaded DC LVDT gage head. These sensors utilize a probe equipped with a No. 9 contact tip and are offered with a PT02-10-6P connection (mating connector sold separately.) Operating from a variety of DC voltages, these sensors are available with a choice of one of four analog outputs. Calibration and set-up is simplified with one wire field programming feature, this provides the ability to match the endpoints of the sensor's analog output with the ends of the range of motion of the assembly to which the sensor is attached. This feature permits a user to optimize the position measuring system's resolution over its full range of motion.